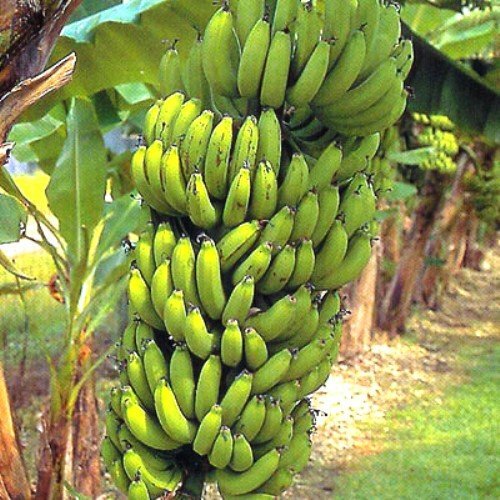 Grand Nain is an outstanding banana variety growing from 6 to 8 feet tall and solid green in color. Very attractive for its landscaping potential and good wind resistance. The 'Gran Nain' produces very large heads of delicious sweet fruit. It is very quick ripening. Gran Naim has no problem producing 40-60 lbs. of fruit. This is the Chiquita variety of banana you find at the supermarket. How to Grow: Most all edible plants grow well in Full Sun, a little shade won't hurt. For smaller starter plants I recommend in a four inch pot to start then plant or re-pot. Keep starter plant temperature above 60 degrees. Banana Plants can be planted in most healthy soils with normal pH range 6.5-8. I recommend growing in a good potting soil for your starter plant and then mix up your favorite type of medium when ready to be fully planted. Keep your soil moist and when it is about dried out water again. Make sure you find a fertilizer and follow guidelines. The price includes Four (4) "Grand Nain" Banana Plats with USPS Shipping. These are 2 inch rooted plants shipped in 2 inch tray pots and are 3-6 inches tall. Grand Nain is an outstanding banana variety growing from 6 to 8 feet tall and solid green in color. Very attractive for its landscaping potential and good wind resistance. How to Grow: Most all edible plants grow well in Full Sun, a little shade won't hurt. For smaller starter plants I recommend in a four inch pot to start then plant or re-pot. Keep starter plant temperature above 60 degrees. If you have any questions about this product by Hello Organics, contact us by completing and submitting the form below. If you are looking for a specif part number, please include it with your message. Strawberry Island-20 Chandler Strawberry Plants (pack of 20 Roots for $18.95) - ONE of OUR TOP SELLERS BERRY! Best in Zones: 4-9. By Strawberry Island - Truly Live Plants!